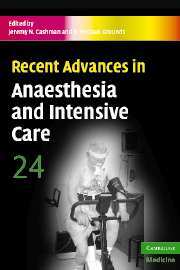 Recent Advances in Anaesthesia and Intensive Care, is a very successful and long-established series, which represents cutting-edge topics for anaesthetists from some of the World's leading authorities in their subjects. This series continues to build on the successful formula of the previous 22 volumes. All articles aim to be of interest to both practising and trainee anaesthetists whilst also increasing the input from intensive care specialists to broaden the series appeal and overall coverage, with the emphasis being to produce articles of a high quality and interest to the reader whilst providing exceptional value for money.